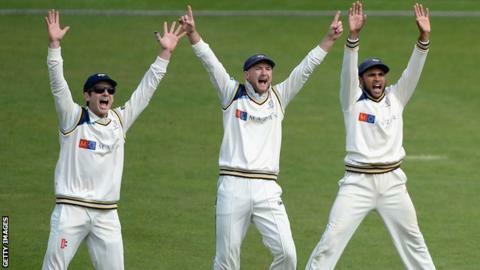 Yorkshire registered their first Championship victory of the season by polishing off Northants on the final morning at Headingley. Last season's runners-up won by an innings and 120 runs after bowling out the visitors for 245. Jack Brooks, Ryan Sidebottom and Steve Patterson took three wickets each, but David Murphy and Muhammad Azharullah held Yorkshire up with a stand of 50. Brooks' 3-76 gave him career-best match figures of 8-112 against his old club. However, after 19 wickets taken by the Yorkshire seamers, it was leg-spinner Adil Rashid who brought the game to an end by having Azharullah caught behind for 23, leaving Murphy unbeaten on the same score. Jack Brooks only began his first-class career at the age of 25 when Northants played Australia at the County Ground in 2009. Now 29, he has taken 167 wickets at an average of 27.32, including five in an innings on six occasions. Having been skittled for 94 in their first innings, Northants' hopes of hanging on for a draw suffered a body blow just before the end of the third day when James Middlebrook edged Brooks to the keeper on 63. And after resuming on 149-4, they were soon in trouble as Sidebottom (3-34) had Rob Newton caught at point and Brooks removed nightwatchman Maurice Chambers, with the help of Adam Lyth at second slip. Liam Plunkett took a one-handed return catch to send Andrew Hall on his way for 12 and Steve Patterson got in on the act with the wickets of Steven Crook and David Willey (20) in successive overs. At 195-9, Northants looked down for the count, but Murphy and Azharullah collected six fours between them in an enterprising batting display before the home side finally wrapped up the win with the fifth catch of the innings by wicketkeeper Andy Hodd. There was more good news for Yorkshire when x-rays on Gary Ballance's finger, hurt when trying to take a slip catch on the third day, showed no serious damage. "This was a fine victory for Yorkshire, who were ruthless in their execution, although Northants did not help their cause with poor shot selection. "Despite the win Yorkshire may make changes to the side for Sunday's game at Middlesex. "England star Joe Root is set to return after a thumb injury to get much needed time out in the middle before the forthcoming Test series with Sri Lanka." "Defeat arrived for Northamptonshire just before 1.00pm and it might have been much sooner had it not been for an entertaining partnership for the last wicket between David Murphy and Muhammad Azharullah. "Quite simply, Jack Brooks and Ryan Sidebottom were too strong for Northants on day one and also again on the final morning and will worry many a top order again this season. "With pace and bounce, their 15 wickets in the match were the difference between the sides. "For Northants, this need not be a season-defining defeat, but they need injuries to heal - and quickly."